Gazpacho is a traditional zingy tomato soup from Spain that showcases the refreshing tastes of its fresh ingredients. This delicious cold soup is a perfect light appetizer to accompany summer cuisine. Serve chilled, and don’t forget extra French baguettes for dipping! Also, use croutons, sour cream, or finely chopped cucumber as an optional garnish (or all of them!). Cold tomato soup never had it so good! Optional: Garnish with croutons, fresh bread cubes, or a dollop of sour cream. Of the many plant foods that provide umami in western tradition, the tomato is foremost. Its attractive, full, rounded savory flavor comes from its high level of naturally occurring glutamate, and this flavor is reinforced by its unique crimson color. The umami theme remains constant, though the way it is expressed varies from culture to culture. Beginning in Asia with fermented soybeans, migrating through England with walnuts and mushrooms and emerging triumphantly with tomatoes in American ketchup, evidence of a deep-rooted worldwide inclination to exploit glutamate-rich foods for savory seasonings and condiments is clear. 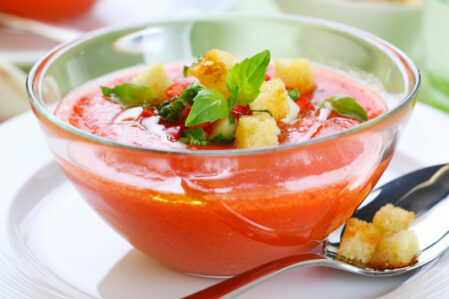 I am spanish, and I recently went to the US and I was surprised that everyone was so fond of gazpacho soup! But I have to say to say many people got it wrong. Gazpacho has to be a really fine soup, no lumps at all, and don’t go too crazy with garlic! I just made this Gazpacho last nite for the family and it was a huge hit! I know there are many recipe variations for this delicious cold tomato soup — but this recipe nailed it! Only thing I added was some diced green pepper, and just cuz I’ve seen it served this way in restaurants I added a teaspoon of sour cream on the top of each bowl (after the gazpacho was served) along with a half of slice of cucumber as a garnish. Thanks, MSGdish!!! If some one wishes expert view about blogging then i propose him/her to pay a visit this web site, Keep up the fastidious work. Next PostThe Colonel (Fried Chicken) Will Be Proud!